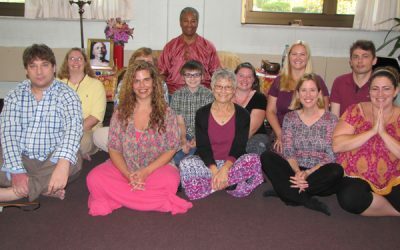 Week-long Shaktipat Meditation Retreat. Sadguru Kedarji. Video! At Nileshwar Shaktipat Meditation, Wellness & Spiritual Retreat Center. 841 Boardman-Canfield Rd, Suite 302, Boardman (Youngstown), OH 44512. **This location is handicapped accessible. What is the one bond of power that guarantees your permanent spiritual transformation and Liberation? How do you attain this bond of power? Can you attain a state that no person, place or thing can mitigate against – a state beyond the reach of your karmas and life circumstances? In this Kali Yuga age, it is said that the Grace-bestowing power of God is easily attained through a competent preceptor or Sadguru. So many scriptures and sacred texts also tell us that spiritual power is required in abundance. This is so because Grace is so necessary in order to reverse lifetimes of karmic tendencies that manifest as your present mental conditioning – your inner state. Besides, how do we attain such spiritual power that will allow you to move the mountain of your false leanings and tendencies? By what means can you insulate yourself against growing distractions, attachment, attraction, aversion and the ceaseless pursuit of sense pleasures? And what role does your intention play in all this? This week-long Shaktipat Meditation Retreat will embody a further examination of Sadguru Kedarji’s New Year’s messages offered over the last 3 years. Today, there are many myths and opinions about intention and the bond of power inherent in Guru’s Grace. Therefore, we will also examine these. The myths will be debunked with the Blessing of fervent contemplation and direct experience. In this week-long, Shaktipat Meditation Retreat, all of the above questions will be answered. There will be a lot of chanting and meditation in this retreat. **In this very short period of time, you can renew your spiritual practice and lifestyle by reigniting the flame of your enthusiasm. In this way, your longing for an existence imbued with boundless Joy and Content will increase. This happens by coming into contact with other devoted seekers and Sadguru Kedarji’s adept companionship as our spiritual leader. This 7-day meditation retreat will culminate in Sadguru Kedarji’s Shaktipat Blessing. This is our annual weekend Shaktipat Meditation intensive honoring Bhagawan Nityananda of Ganeshpuri and the miracle of His Grace. For this reason, this intensive is named The Miracle Intensive. Early morning open Meditation, followed by morning chanting program. Afternoon breaks to be in Nature. Afternoon courses led by Kedarji. Evening program of examination of spiritual disciplines, meditation and chanting, led by Kedarji. A bonus session on the topic of our 4 Pillars of Total Well-Being. In addition, there will be time set aside for rest and Guruseva. Nileshwar Shaktipat Meditation, Wellness & Spiritual Retreat Center. 841 Boardman-Canfield Rd, Suite 302, Boardman (Youngstown), OH 44512. **This location is handicapped accessible. Nearby airports are Pittsburgh International airport, Youngstown/Warren regional airport and Cleveland Hopkins International airport – all within 60-90 minutes or less from Nileshwar Retreat Center. $1,349 per person for the full retreat. The retreat cost includes any and all study materials used in the retreat. Seven nights of shared accommodations (Sun. through Sat.) in private rooms. Three vegetarian home-cooked meals each day (except the last day of the retreat in which dinner is not served). **If your overnight stay needs to be extended for up to 2 nights, additional accommodations can be purchased separately at $55/night. **Once your application has been approved, you can return to this page and use the button below to enroll. We cannot promise that single rooms will be available for this retreat. Single room assignments will be made, based on availability of space. Single room assignments will only be made, after July 22nd, when we know if there is available space. If you need a guarantee of a single room, we suggest that you opt for the commuter enrollment (see below) and seek accommodations at local hotels. If you snore on a regular basis, you must indicate that on your application for this retreat. If your application is approved, we will contact you about accommodations, if you intend to have them. Those living locally and anyone who does not need overnight accommodations may attend this retreat, as well. $1,019 per person for the full retreat. The retreat cost includes any and all study materials used in the retreat. Meals are included in the commuter package at no additional cost. Accommodations are not included. A deposit of $350 is required to hold your place for the retreat, regardless of which package you choose. You can also choose to pay in full. Deposit deadlines and balance deadlines are indicated in the application package. Your deposit is refundable up until June 30, 2019, minus a $25 handling fee. After June 30, there are no refunds. The balance of your enrollment fee is due in full by July 16, 2018. The balance of the enrollment fee is non-refundable. Your application must be approved first. If approved, you will receive payment instructions via email, and you are encouraged to make your deposit as early as possible to reserve your place. Use our contact form, to request your application.